When bidders see lot photos and descriptions, they must have sufficient numismatic skill to determine whether and then how much to bid. This particular lot description and photo have several issues. Can you identify them? 1. The photos are too washed out to judge luster, essential in buying mint-state Morgans because so many have been dipped and so are deemed ungradeworthy. 2. The holdering company is Numismatic Authentification Service, an off-brand. When you do not know about a holdering company, conduct a web search that contains reviews of it. If you put this company’s name in Google, you come up with these results. 3. The lot description contains a figure about value, but does not indicate where that figure was taken from. 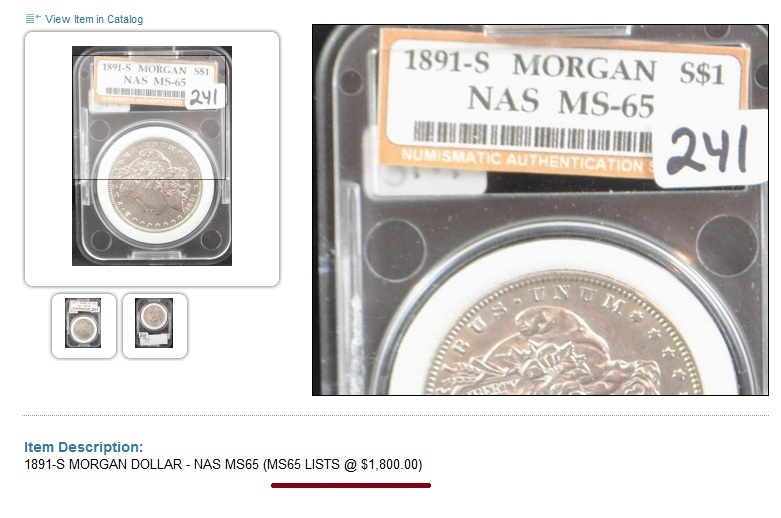 A little research turns up these figures: PCGS ($1765); NGC ($1775); and Coin Values ($1600). Each value, however, only applies to coins graded by PCGS, NGC, and top-tier companies (ANACS, ICG). Each of those issues represents a warning not to bid or to place an informed bid. Do not rely on what the auctioneer states in the lot description unless you have done business with the company before, trust the auctioneer’s grading judgment, and can view clear, sharp expandable photos of the coin. This entry was posted in Best Practices and tagged American Numismatic Association, Auctioneers, Best Practices, Coin Auction, iCollector, National Auctioneer Association, Proxibid, Proxiblog. Bookmark the permalink.